SAN DIEGO — The 2015 Etchells National Championship proved the old sailing adage that nothing in a regatta is certain until the very last race. Marvin Beckmann and his crew faced a difficult task going into the last race of the regatta. After a scratch performance in Race Seven, they had put five boats between them and Etchells World Champion Bill Hardesty in order to win the regatta. After winning a key pin off the starting line, Beckmann and his crew proved they were up to the task by finishing with their third bullet of the regatta. Eagerly watching the finish line, crew member Stephanie Robles started counting off the fleet as they crossed. Jim Cunningham finished second, followed closely by Tyler Sinks and Alex Camet. Carefully doing the math in their head, Beckmann and his crew knew the next boat was the crucial one. A fifth place finish would give Hardesty the regatta outright, while sixth place would end in a tie. The tie breaker would go to Beckmann, since the last race gave him one extra bullet over Hardesty. When Shannon Bush crossed the finish line, Robles erupted into a cheer, letting the crew aboard Beckmann’s, The Martian, know they officially won the regatta. Beckmann’s champion lineup featured Danielle Septembre at the bow, Stephanie Robles and Steve Hunt. Hardesty would later finish the final race in 11th, his lowest score of the regatta. That leftie propelled Hardesty to a third place finish in Race Seven, with Beckmann finishing in eighth, his throw-out score for the regatta. Perhaps the most impressive run in Race Seven came from Tyler Sinks and his crew aboard Lola. Sinks was one of four boats called OCS at the start of the race. Alex Camet, Bruce Nelson and Phil Lotz were also called OCS and had to re-cross the start line. Not one to let a bad start get to him, Sinks continuously gained spots on the first upwind leg, ultimately beating the rest of the fleet to the windward mark. His first place finish was well over a full minute ahead of the rest of the fleet. Sinks and his crew finished third in the second race of the day, securing their spot at fourth overall. While the start may not have played a significant factor in Race Seven, it would prove to be crucial in Race Eight. Beckmann pinned Hardesty at the left side of the starting line. Both boats held their positions for 90 seconds, nearly a lifetime on a racing start line. By the gate mark, Hardesty had fallen to ninth place. He gained two boats on the next upwind leg, but lost four on the downwind sprint to the finish. 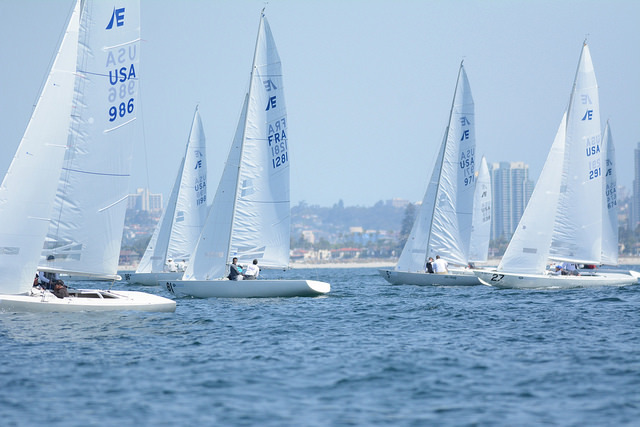 The 2015 Etchells National Championship is the third of four regattas in the West Coast Series. The next regatta, the ORCA Bowl, will take place May 16 and 17 at the San Diego Yacht Club. For more information, visit sdyc.com/etchellsnationals.